If you’re overwhelmed by your e-mail, Mail’s rules can help. Use these simple yet powerful tools to sift through your e-mail and apply changes to messages, filter messages into specific folders, forward them automatically, set off alarms, and more. 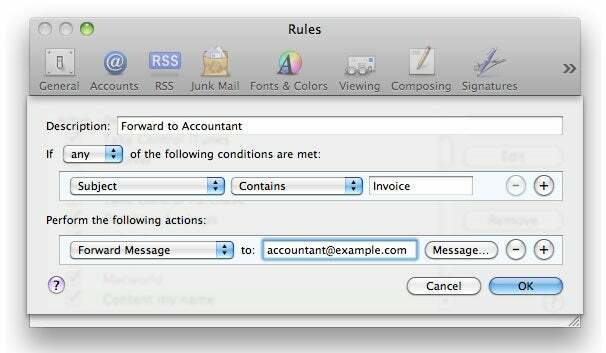 Using e-mail rules is easy, and Mail’s interface lets you set up their conditions and actions with just a few clicks. Here are five essential e-mail rules that will help you take control of your correspondance. One of the most practical rules I use changes the color of certain messages to make them stand out. I use this rule to highlight mail from specific friends, accounts, or clients. First, to create a rule in Apple’s Mail, choose Mail -> Preferences, then click on the Rules icon. You'll see a list of your rules here. Mail goes through these one by one in the order you see them. You can change their order by dragging a rule up or down. This rule changes the color of messages from my Macworld colleagues. That way their messages stand out. The second section of the rule contains the actions you want Mail to take on messages that meet the conditions. I used the pop-up menus to do a number of things. First, Mail will move messages that meet either of the conditions into my Inbox. Mail will change the text to purple and then mark the messages as flagged. Finally I ask Mail to “Stop Evaluating Rules.” I find that if you don’t add this final action, you sometimes get unpredictable results. Mail may do something different to a message because another, later, rule may act on it. Click OK, and Mail will ask if you want to apply your rules to existing messages. In the future, you’ll find that messages from the domains you specify appear in the color you specified and get flagged. Use this rule with any domain, or even a single address, that you want to stand out in your message list. I participate in a number of Internet mailing lists and get lots of e-mail from them as a result. I might not be able to read every message right away, but that doesn’t mean I want to miss out on the conversation. To help myself keep up, I use a rule to indicate when my name is mentioned in a message—for example, when someone replies to something I said or asks me a question. Granted, with an uncommon name like Kirk, I get a few false positives; if your name is Jennifer or Jason, you might want to enter your full name. Even then, not all messages will get flagged as your full name may not always be mentioned. This rule highlights with a green background messages that include my name. This is a simple rule; it merely looks for “Message Content” that “Contains” “Kirk,” and then changes the background color to a light green. I don’t do any other filtering, and allow other rules, as you’ll see later, direct some of these messages to specific folders. But whenever a message has my name in it—or that of any other Kirk—the message will appear highlighted with a green background, prompting me to pay attention. If you belong to a bunch of mailing lists like I do, you’ll appreciate that it’s helpful to keep these messages separate from your regular mail. I have some folders in my Mail sidebar to sort my lists so the frequent messages don’t crowd my Inbox, and so I can view them at my leisure. A simple rule makes Mail sort messages in this manner automatically. This rule looks for any of a number of recipient addresses (for example, ones that are associated with mailing lists) and files messages away in a folder. Next, create a rule where “Any Recipient” “Contains” the recipient you want to use. For individuals, that could be “Is” instead of “Contains,” but for mailing lists, “Contains” works better, because some people use cc or bcc addresses in such messages. If you want more than one address, just click the plus-sign (+) icon to add another condition. In the actions section, choose “Move Message” to mailbox, and choose the folder you created. In most cases, you’ll want to add “Stop Evaluating Rules” to make sure that other rules don’t move the message again after this rule has acted. There are some messages that I want to forward to other people or accounts, and doing so automatically saves time. For example, if you receive invoices by e-mail, you might want to set up a rule to forward them to your accountant. This rule automatically forwards messages containing the word "invoice" to an accountant. Create a rule where the “Subject” “Contains” “Invoice,” or any other word or phrase that you want to look for. In the actions section, choose “Forward Message” to an e-mail address. If you click on the Message button, you can even add a text that will automatically be inserted in the message being forwarded. You can use just this single action so you still see the message in your inbox, though you might want to add another action to file it away in a folder after it’s forwarded. Say you’re waiting for e-mail from your kids, Alice and Bob. You can set up a rule that tells Mail to bounce the Dock icon, and play a sound, when such e-mail arrives. This simple rule gives you audible and visual notification when you get a message from a certain person. Just create a rule where “From” “Contains” an e-mail address; click on the plus-sign (+) to add more addresses. In the Actions section, choose “Bounce Icon in Dock” and “Play Sound”, then choose a sound. The sound will only play once, but the Dock icon will keep bouncing until you click on it, so you’ll know when these messages have arrived. Senior contributor Kirk McElhearn writes about more than just Macs on his blog Kirkville. Follow him on Twitter at @mcelhearn. Kirk’s latest book is Take Control of iTunes 10: The FAQ.